Just below the main altar in the splendid Basilica of St Mary Majors, Rome, it is possible to venerate the precious relic of Our Lord’s crib. The relics are protected in an elegant crystal reliquary in the form of a manger which is supported by four golden angels. It is closed by a lid that looks like a bed of straw covered with a cushion on which the Baby Jesus rests. 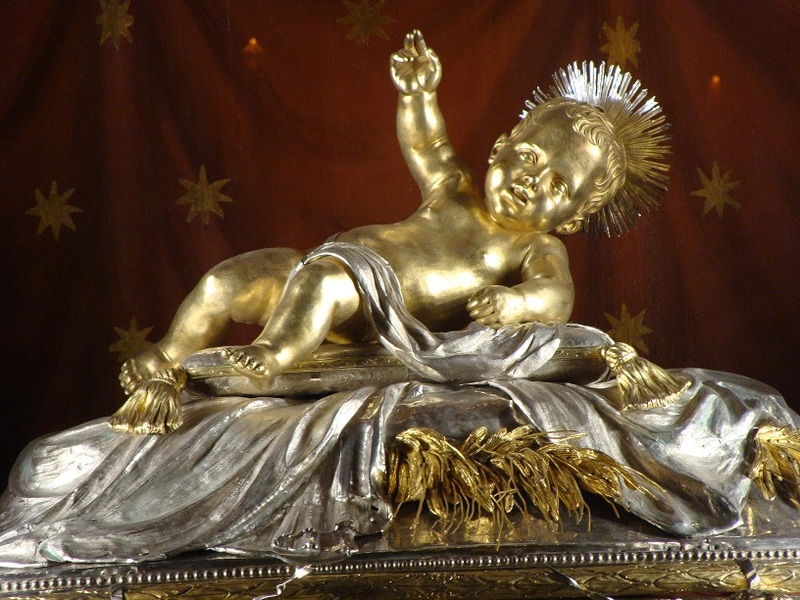 The Baby Jesus is lively and smiling lying on the bed with his hand raised in benediction towards those who observe him. 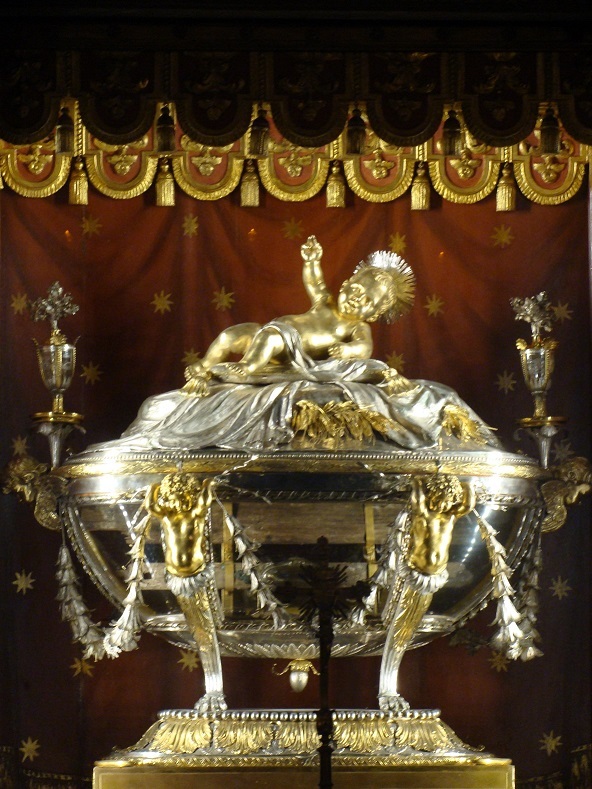 The reliquary was realised by Giuseppe Valadier in the early 19th century to substitute the previous reliquary from the 1600s that was stolen by Napoleonic troops. Through the lucid crystal reliquary, you can make out some wooden slats in red maple that are typical of Bethlehem. The relics date 2000 years to the time that Jesus was born. They arrived in Rome thanks to Pope Theodosius, himself a native of Jerusalem, who arranged their transit. In 635AD the Saracens besieged Jerusalem and the Patriarch Sofronio could not celebrate midnight mass on Christmas Eve 636AD in the Bethlehem grotto. Saddened by this situation he asked the Pope for his assistance and the relics were then transferred to Rome for safekeeping. Today, St Mary Majors Basilica still has custodianship of the relics and this fact is reflected in the fact that since the 7th century the Basilicas has had the title Santa Maria ad presepem.